More of my early quilts have been added to the Page that chronicles my history of quilt making. This is a detail of one of them. And just a reminder that the Alzheimer's Quilt Auction is ongoing until 10:00PM this next Saturday. This is an opportunity to own a wonderful piece of art ... or to shop for a delightful gift. WOW! This such a wonderful quilt. I luv absolutely everything about it. It almost makes me want to be a hand quilter! You were doing amazing stuff right away, I think I'll give you an honorary "Turbo Quilter" award. Lovely fabrics and beautiful quilting Nellie. I never mastered hand quilting to my satisfaction - it's such a simple stitch but so hard to achieve an acceptable result. Just fascinating to see your past as well as your present. Your artistry always shines through! 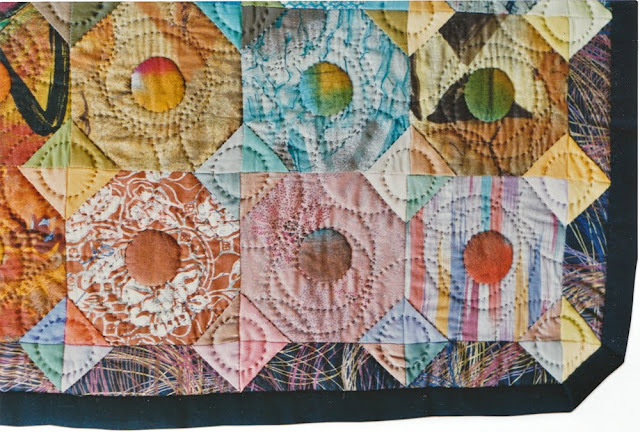 My, my -- that hand quilting is so beautiful! Gifts In the Spirit of "Earth Day"